I was having a serious case of mid-week burnout last Tuesday, and really needed a dose of self-pampering. Sometimes retail therapy really doesn’t cut it, and nothing beats the quiet, aromatic serenity of a beautiful spa. Spa Zen at Nassima Royal Hotel has built quite a repute for its long list of holistic treatments, and their newest addition is The Royal Hammam Ritual. Last weekend saw our little family packing up our overnight bags and heading off to the capital. Located in the heart of the financial hub of Abu Dhabi, Capital Centre Arjaan by Rotana seems to be an unlikely choice for a family getaway. With offices and convention centres a stone’s throw away, the hotel has a regular influx of business guests. However, much to our delight, the property also proved to be a nest of comfort as a home away from home. I was introduced to this gorgeous brand by my massage therapist at Chi Spa, Shangri La. Red Flower is an organic natural beauty brand hailing from the United States. Using the finest of ingredients, Red Flower combines the wisdom of beauty rituals that have been passed down for generations across a multitude of cultures. Chi Spa at Shangri La (Dubai) uses a number of Red Flower products for their various treatments, and also sells the brand in their retail space. 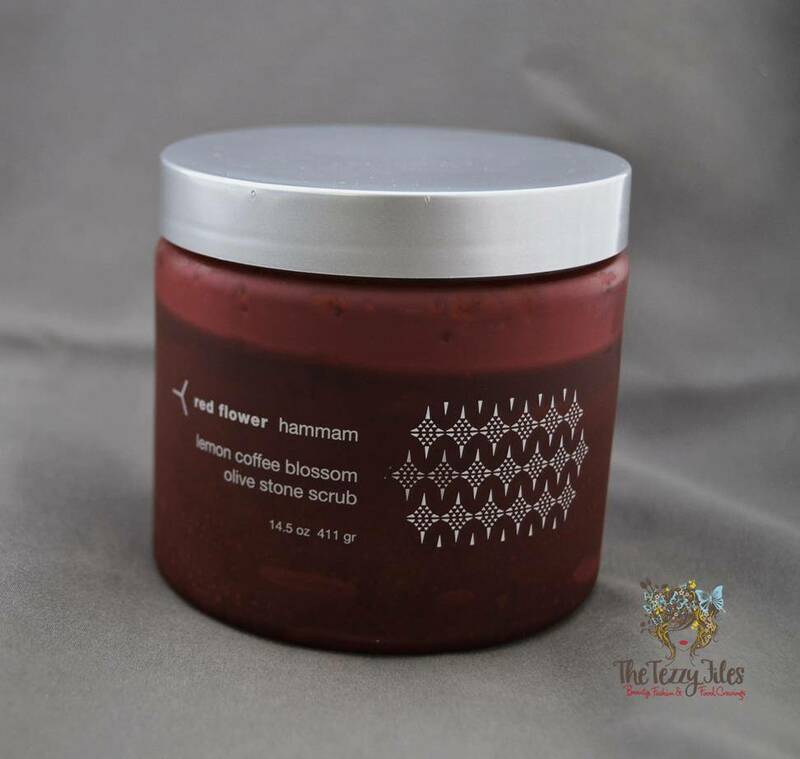 The Lemon Coffee Blossom Olive Stone Scrub was one of the first Red Flower products I spotted on their shelves. One whiff, and I was sold! At AED 290 for a 411 gram tub, this scrub does not come for cheap. But that scent, oh how I love it! Its a combination of deep, dark roasted coffee with a fresh spark of lemon.